Bumble Bee Standard Box Choose an optionYes Please! (+£10.99)No Thanks! Bumble Bee XL Box Choose an optionYes Please! (+£5)No Thanks! Earn up to 310 Stitchy Points. 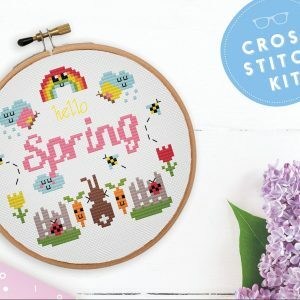 Each month you will receive one full cross stitch kit (embroidery hoop/material 14 count aida/thread/needle/full colour pattern included), 2 additional bonus patterns, Pom Pom trim for decoration, a 15cm x 15cm piece of premium material plus some sweet treats for you to enjoy! All of which comes gift wrapped in tissue paper, sealed with a personalised name sticker and sprinkled with unicorn poop confetti (yep its a thing) Plus you can ‘Add on’ £5 to your club box to receive the additional hoop/threads and pom pom trim to complete the mini pattern which is already included in your box! Check out all the benefits you get for FREE for being a club member! Pretty sweet right? 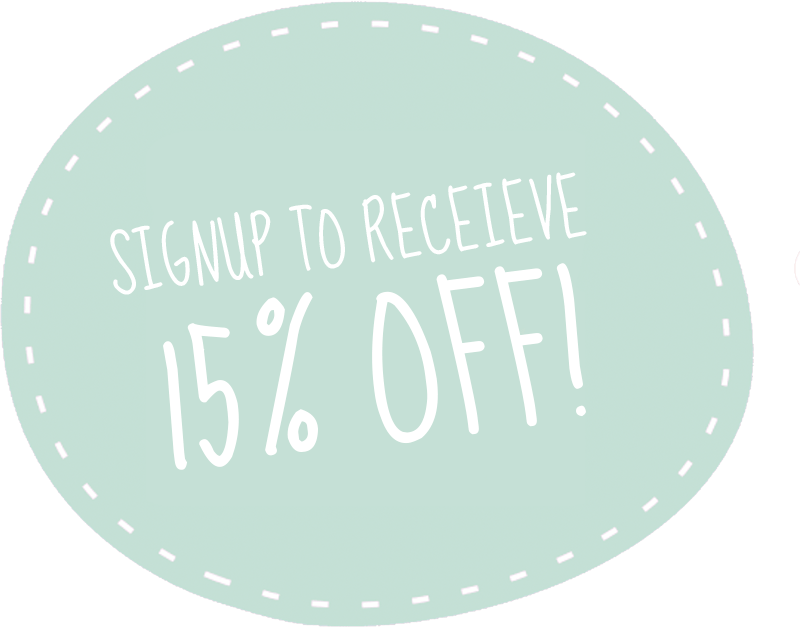 FREE access to the PDF club (just click on the Sub link and add to your basket, don’t worry you won’t get charged!) Worth £50! If you decide to go with the one off sub payment, you only have to pay shipping for the first month & you get a sweet discount too! Please make sure that you select the correct shipping method (whether you are based in the UK or Overseas) if the incorrect drop down is selected we will not ship your box until the balance has been paid. Yes Please! (+£10.99), No Thanks! Yes Please! (+£5), No Thanks! Yes Please! (+£14.99), No Thanks! I’ve been subscribed to the Geeky Stitching Co for almost 16months now & I have loved EVERY single box that has arrived! I look forward to finding it on the doormat when I get home from work & ripping it open to have a good look at all the patterns inside! I’ve been saving up the Alphabet mini-patterns that have been included the last few months & once I have the full set I plan to do a HUGE cross stitch of them all together as a sampler! ? 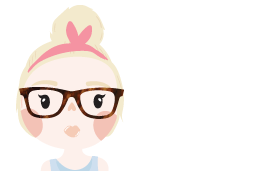 Jess is an amazing person, if you ever have any issues with your sub (a box hasn’t arrived, any payment problems) she is SUPER quick at getting them resolved for you & always does so with a smile – I honestly don’t know of any other business I have used that I have loved interacting with so much! 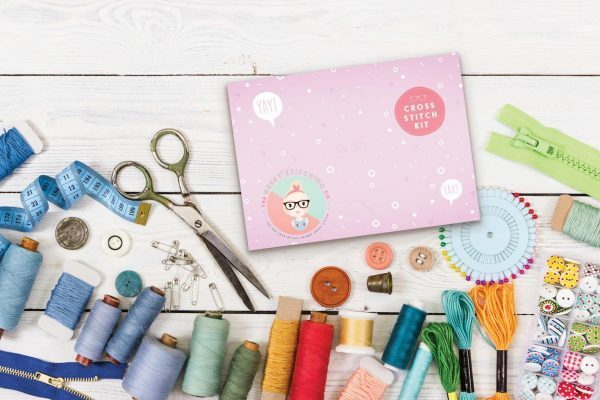 Every month I look forward to my Geeky Stitching Company subscription box popping through my letterbox, so much thought and care goes in to every box and the patterns are so modern and cute! By far the best subscription I have had. It helps with my mental health as a distraction, the designs are super fun and exceptionally addictive and also everything is packaged with such care. Sweet treats, confetti and personalisation. Plus Jess is a babe! 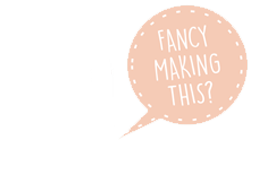 I found the geeky stitching co back in December ‘17 when I wanted to get into a new hobby and cross stitching has quickly became that. I have been subscribed since January and it’s been lovely having something to look forward to stitching each month. Every box comes personalised with your own name sticker on the outside and inside it is beautifully wrapped in tissue paper. Each box comes with a mini 4” kit & 5-6” kit that includes all the thread you need to complete them as well as an extra pattern and skein. Jess has been lovely and is very responsive to emails and letting me know when my box is on it’s way! Yo, this is such a happy little thing to have land in my letterbox every month. Always perfectly timed as a brilliant little pick-me-up! The patterns are easy to read, the threads are more than enough to do the main pattern, and there’s the bonus piece of aida for a second design which I just adore. Lots of fun! That’s all I have to suggest 🙂 There’s really not much to suggest about this subscription it’s really wonderful! I love making this cute patterns for my family and friends! Received my first box yesterday. Loved the main design and the extra patterns. Excited to stitch the Halloween design on the black Aida. Thank you for these fun designs. I absolutely love these boxes! The mot recent Halloween box is so adorable, and I cannot wait to stitch them ready for Halloween. I get excited every month when I come home from work and there’s a box waiting for me. Brilliant company too. Very lovely people. If there is ever a problem, they are easy to contact and will get back to you ASAP. I’m so glad I found this subscription service! I’ve just received my very first subscription box and I LOVE IT!! I’ve been buying cross stitch kits from Geeky Stitch for a while now and I’m building up a nice collection. They are so cute and come with everything you need. There is even a sweet treat in there for you to enjoy while stitching away! The owner is incredibly helpful with any inquiries I have. 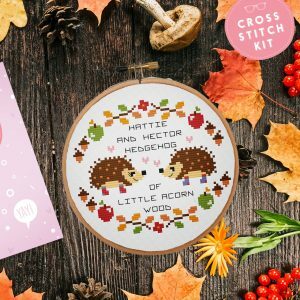 I will be buying many, many more beautiful cross stitch kits from The Geeky Stitching Co! Absolutely adore these boxes! You get 3 patterns; a main one which comes with thread, fabric and a hoop so it’s ready to go straight away, a mini pattern that comes with the fabric and also a letter of the alphabet which are so cute! The patterns are really easy to follow and they don’t take loads of time which is great if like me you love seeing results! Plus, the box is always personal and cute with sweets and little confetti (loved the Halloween box especially!). Jess is super nice so follow her on Instagram to see updates? I recently found the Geeky Stitching Co and their Stitching Club, let me just say, it’s amazing. Getting a box of goodies every month to stitch, is the best thing ever. Not only do you get an awesome surprise, but you get to stitch it and show it off! What more could you want? What on earth are you waiting for? Get in on this now! It’s amazing. I bought a 3 month subscription of this is a treat for myself. I’m currently in a lot of pain on my third pregnancy and keeping my hands busy is a great distraction. These kits are super adorable and very easy to follow. I’ve already gifted one to a friend who loves toucans!! Definitely a nice treat every month. Already renewed my subscription to the auto renewing one. I have only been a member for 2 months but I love everything about the geeky stitching subscription box! The attention to detail and the personalisation is beautiful. I couldn’t ask for more from a subscription. The box includes everything you need for the main pattern of the month, which is a different theme every month, you get a little heart shaped sweetie, and its all wrapped beautifully in tuisse paper. I can not fault it one bit. I was so excited to get my first club box in the mail today! First up, great packaging really showed attention to detail! Fitting for Halloween, it had some fun confetti and candy inside. I haven’t started stitching yet, but the patterns are easy to read and the supplies are all good quality. The floss came on a perfect little organizer, which is a small detail, but one I appreciate. I was hesitant about subscribing at first, but it was absolutely a great choice. I found Geeky Stitching Co through a friend and I am so glad I did!! I was given my first subscription as a present but just had to keep it going when it ran out. I absolutely love all the designs Jess comes up with – they’re so unique and cute!! I love displaying them around my house and get so excited when I see that special little box on my door mat! Even my son jumps up and down (although that may have more to do with the lolly inside ?)! Jess is super friendly too which is amazing and it’s so lovely to see her reply to so many of her subscribers on social media. It just goes to show how important it is to her which makes it more special for everyone else. Would highly, highly recommend signing up!! 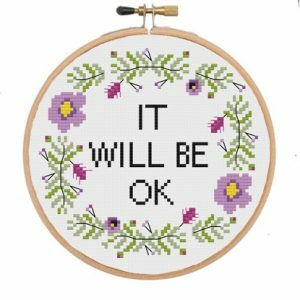 I have been subscribed to this cross stitch club for 2 years and each month I am always surprised. The boxes are the highlight of my post and I enjoy receiving and stitching up the goodness inside. Love everything about the Geeky Stitching Co subscription box! Super cute designs and everything you need to start as soon as you open the box! Am always compelled to complete the theme and make the mini design too! Thanks Jess!! The best happy mail anyone can receive! The patterns are easy to follow and everything is included, making this a fun and relaxing sewing project at the end of the day. I absolutley love receiving these. Its always such a delight when they arrive. Jess and her team are amazing and following them on social media is a great way to keep up to date with new stuff! 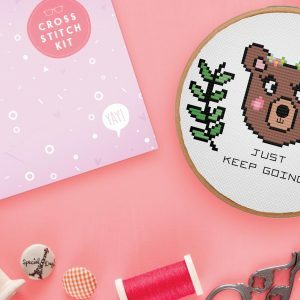 Since getting back into cross stitching to help with anxiety ive been singing the praises of the Geeky Stitching Co subscription box to everybody I know. The designs are adorable and they have kept me busy for days. If I could rate more than 5 stars I would in a heartbeat. I received my first subscription box in the mail yesterday. My mom is gifting me a year subscription for Christmas and she started it a few months early! I will probably keep it going after the year is over. I loved the packaging, the way everything was wrapped with the paper and cute sticker. I don’t do sweets but the lollipop was cute. I received three patterns, materials for the main pattern, a hoop, needle and fabric. The patterns are in color and easy to read. I am very excited to make them! The communication has been wonderful as well, Jess is very easy to reach and responds quickly. I loved everything! Absolutely love the geeky stitching club! The kits are so easy to follow and quick to stitch up that I end up buying other kits in the month to keep me going!! I would definitely recommend this club to beginners and experts alike as the designs are so cute that its a joy to stitch them up and I am always disappointed when I’ve finished because I want to do more. Everything is clearly packed with care and you can tell that Jess designs with a real passion and love for stitching. Its a shame that the most you can give is 5 stars as I feel that geeky stitching club deserves a lot more. I absolutely love this subscription. Each month I get an adorable package all the way from England (I am in the US) and my daughter and I love looking at the customs info and the “Royal Mail” seals. This month’s box had a sticker with my name on it – Emily’s Box! It has pretty tissue paper and confetti and she grabs the lollipop (boiled sweet??) each time. It is so nice to get two projects – and all of the things needed to do those projects- all together. Sometimes the most annoying part of starting a new stitching project is getting it all together. With the subscription box, that is all done for me. All I need to do is grab my scissors and find a comfy spot on the couch to get started. The patterns are so fun and unique, and everyone that sees them loves them! They are quirky so they don’t feel like your grandma’s old stitching! The best part of my month is getting home from work and finding my club box has arrived! The kits are beautifully packaged and the designs themselves are so cute and easy to do. You can tell each one is put together with love, and it’s a lovely touch. I’ve been a geeky stitches for a few years now. I love receiving my club box every month. So much fabulousness for a super price! I absolutely adore everything to do with these subscription boxes! The easy to follow patterns, the cute little designs, the sweet treat and of course the sparkles! I have had a few issues with moving and boxes being sent to the wrong address but the team could not have been more helpful with sorting this for me, even sending me a replacement box for free! I really love the sub boxes! I’m currently waiting for my 3rd one to arrive and I’m so happy I decided to subscribe. Adorable designs, puns that will make you laugh, lovely packaging and great customer service. I never tried cross stitch before, but I didn’t have any problems following the instructions, so I think they’re great for beginners. Just try it, you won’t regret it! I’ve just finished my Under the Sea themed club box. As always, the kit was such a lovely way to relax and wind down after a day at work. The designs are always fun to stitch up and as a relative newcomer to cross stitch, they patterns are also easy to do. I’m looking forward to getting my January box! I am a new subscriber after receiving a box for Christmas. Becoming a member is fantastic, I’ve just got my first subscription box and can’t wait to get started. I love all the attention to detail and hard work by the team to make these boxes exciting. I have purchased quite a few kits to make up as birthday gifts for family and friends ? Happy Stitching ? I signed up three months ago and I absolutely love this subscription. It helps me wind down after a tough day at work and keeps me occupied when my other half is working away. I get super excited when my new box arrives, its like a wee present every month! Can’t wait to get started on February’s box! Just got my first box today and it just made me smile. So cute and happy and sweet. I got more than I was expecting for my subscription fee and got it faster than I expected (I live in the USA [sorry. I didn’t vote for him I promise]). Just so much happy ?? Had first box arrive. I love the packaging made it feel special. I also love the patterns so easy to do and look so good once done . I received my first box today and absolutely love it! the personalized sticker is awesome and the packaging of the kits looks terrific! thank you so much! These boxes are amazing! Lovely little projects that are easy to make and fun to stitch. I’m in love with them! I love my subscription box! Such a fun treat! The patterns are super cute and the kits are high quality! Loved my club box. My daughter loves the sweeties. Everyone is happy ??? Just got my first monthly box yesterday. Everything was so beautifully packaged. The designs are so sweet, and the messages so uplifting, that I just feel good when I am stitching these. Everything is top quality, too, with plenty of thread to complete the pattern. This is my third stitching box. I absolutely love seeing 8t in my letterbox. Especially after a long day at work. Relaxation at its best! I’ve been a proud Geeky Stitching Club member for nearly 2 years now, and hopefully many more to come! The designs are always cheerful, complex enough to be challenging but not so complex as to alienate a newbie stitcher. The sub box is well worth the money for how much you get and is a fantastic way to start building up your own cross stitch supplies. Jess is always lovely, helpful and quick to respond with any queries. I’ve never had any issues with my box being lost or damaged etc. Can’t recommend this sub box enough! There is now also a Facebook group where you can keep in touch with other Geeky Stitchers and see their progress! I really love my subscription box; I am so please I decided to treat myself. Everything is so beautifully designed and packaged. All the materials are really high quality and the charts are so clear and upbeat. I can’t wait to start and I’m already looking forward to the surprise of next months box! Thank you. I have had the GSC subscription for a couple of months and have loved every pattern. There are so many cute patterns to purchase separate too all at great prices, with lovely little personalisation on each order note. Jess also recently held an order for me and combined with my club box to save on postage, I didn’t need to worry my parcel being sent back whilst on hols. Excellent customer service. Thank you Jess! Amazing, amazing, amazing. The patterns are gorgeous, the package arrives like a present every month, it’s the highlight of my week when it arrives. Jess is the most wonderful person, who puts people over everything else. Cannot recommend more.